Gary Con was last weekend, and a great time was had! I am still in Wisconsin, visiting family, but I would like to shout out to all the great people I met and gamed with and say THANK YOU! It was gratifying to have dedicated gamers willing to fill a table for a 10 pm - 3 am slot, and I hope that I did not disappoint! I will almost certainly return next year (barring some emergency), and try to work my schedule so that I have more time to hang out with people. To the player in Tomb of the Squonk who lost his dice - I have them. Give me a shout and I'll make sure that they get back to you. Again, great Con! Thank you! Here are a few extras from a recent(ish) DCC project that either didn’t fit the space requirements or tone of the product. I present them here so that you may use them in your own games. Pustule: A yellow pustule on the (1d4): (1) right wall, (2) left wall, (3) floor, or (4) ceiling quivers with mucus-like pus. If interacted with in any way, it bursts, spraying pus in a 30’ radius. A Reflex save (DC 5) avoids the pus. Touched characters get a DC 10 Fort save each round to avoid losing 1d3-1 points of Strength, Agility, or Stamina (PC’s choice) as the pus eats into his flesh. Once a character makes a successful save, the damage ends. Characters who survive long enough can heal the damage normally. A ranged attack against AC 7 can burst a pustule from a safe distance. Polyp: A bulging reddish polyp emerges from wall, ceiling, or floor. The polyp quivers slightly, straining towards any character approaching it. Should a PC touch the thing, it attempts to envelope him. The PC may attempt three Strength checks to break free: DC 5, DC 10, and DC 15. Thereafter, he is completely encased within the polyp. 1d5 minutes later, the polyp spits the character back into the corridor, healed of all wounds, diseases, and poisons. Any given polyp can only heal 1d3 PCs before it goes black, shrivels, and falls off the surface of the hallway. Antibody: Init +3; Atk touch +0 melee (0); AC 6; HD 1 hp; MV fly 40’; Act 1d16; SP attach, reduce Agility and speed; SV Fort +0, Ref +0, Will +0; AL N.
The dungeon is alive, and is patrolled by its own antibodies, which seek to deal with foreign substances. These are small blue fleshy spheres, covered with bumps and prongs, which fly in groups. Antibodies cause no damage, instead attaching to whatever they hit. Attached antibodies are no longer active. They can be removed with alcohol or acid (including the pus from pustules), and do not “reactivate” if removed. Every three antibodies attached to a character reduces that character’s Agility by 1. Every five antibodies attached to a character reduces that character’s movement speed by 5’. If speed is reduced to 0’, a character can no longer move on his own. Blue shade: Init +0; Atk none; AC 10; HD 1d4; hp 3; MV fly 50’; Act 1d20; SP non-corporeal, telepathic; SV Fort +0, Ref +0, Will +7; AL N.
This alien creature is a non-corporeal sphere, 30’ in diameter, in which everything appears to be a shade of cornflower blue (including any PCs within the sphere). It is nothing more than a color in this plane, and can neither harm another nor be harmed. It is telepathic, interested in everything, understands next to nothing about life in this plane, and is as annoying as all hell. It always answers a question with a question. 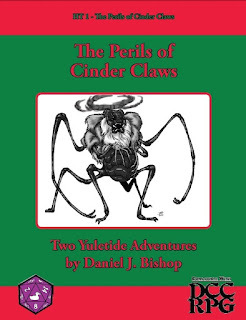 Its voice is always calm, and it insists that it is smarter than everyone it has yet encountered in the material realm. If PCs become upset, or if a violent encounter occurs, the blue shade calmly suggests that everyone stop and consider things rationally. 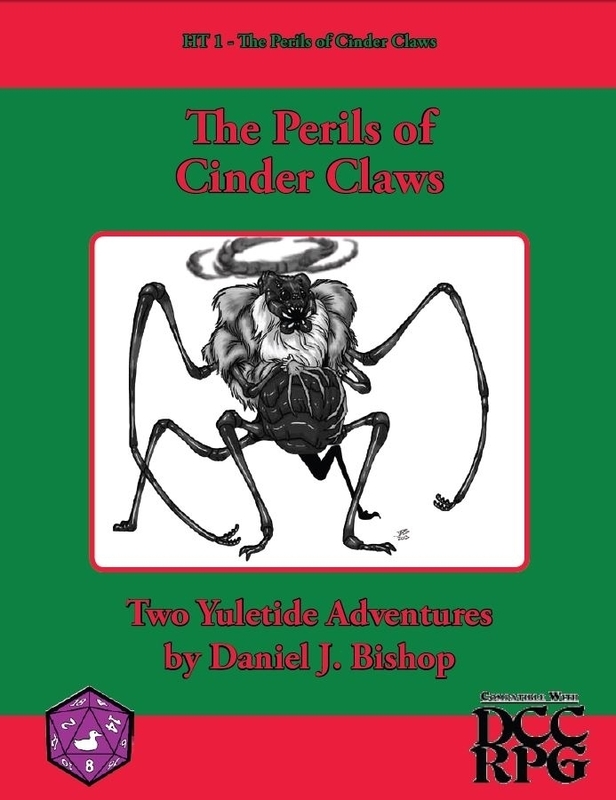 You are aware that the creature you are interacting with will die if you pierce it with the pointy thing you are holding, aren’t you? The blue shade remains for 10 minutes of actual game time, or as long as the judge desires. 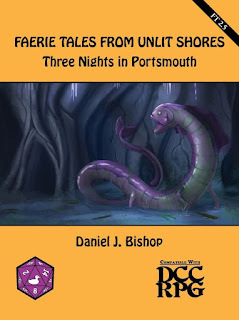 Giant tapeworm: Init -2; Atk bite +1 melee (1); AC 9; HD 1d6; hp 4 each; MV 30’; Act 1d20; SP attach, blood drain; SV Fort +4, Ref +2, Will +0; AL N.
These are 5-foot-long parasites. A giant tapeworm that successfully attacks its foe latches on, and will not release its hold until dead. Thereafter, the tapeworm drains 1 hp of blood each round. The corpse of a creature killed by a giant tapeworm cannot be used to open a sphincter (although the giant tapeworm corpse can do so). Graffle: Init +2; Atk stick +0 melee (1); AC 15; HD 1 hp; MV 20’; Act 1d14; SV Fort -2, Ref +2, Will +0; AL L.
Graffles are tiny humanoids, no more than a foot high. They wear clothing, but seldom wear pants, and their torsos are covered with shaggy fur. There is another tuft of fur at the end of their tails, and they have a tuft of fur at the top of their heads. They are generally inoffensive, and prefer fleeing to fighting. The Graffles claim to hail from a place called “Graffle Boulder” and refer to the dungeon as “this weird place in outer space”. Orb of Temptation: A glass orb, 6 inches in diameter, which seems to contain a naked human woman. A PC gains 1 point of Strength as soon as he picks it up. The woman within the orb will answer one question for any given character, but only one question ever. The orb must be passed to another character to get another answer. As soon as the new character takes the orb, he gains 1 point of Strength, and the previous character loses 1d3 points of Strength. The woman in the orb always answers questions truthfully, as succinctly as possible, and she knows everything that the judge knows. She asks the question asked, rather than the question intended. The players may choose to pass this object to new characters as often as they like, so long as they are willing to pay the price. 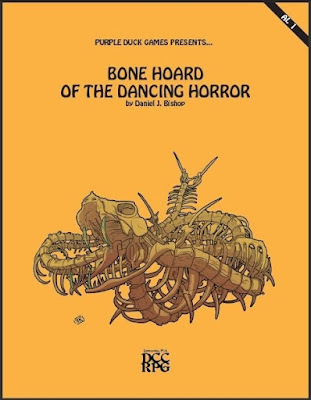 As some of you may know, my first published product for Dungeon Crawl Classics was also Purple Duck Game's first DCC product - AL 1: Bone Hoard of the Dancing Horror. It's nearly five years later, and I have 24 products with Purple Duck Games, either already out or nearly there. I've written for other publishers as well - they're like Pokemon; I gotta catch 'em all - but it is Purple Duck that I keep coming back to. So, the purpose of this blog post is twofold: First, I want to convince you, budding would-be adventure writer, that you should submit to Purple Duck. Second, I want to tell you about a Patreon project Purple Duck Games just started. As to the first, Mark Gedak, the publisher of Purple Duck Games, is a great guy who has never in any way, shape, or form been anything less than a joy to work with. If you don't know it, publishers in this industry bleed money. After paying for writing, art, cartography, and layout, every project leaves them in a hole waiting for the Gentle Reader to become the Gentle Buyer and dig them out. Despite being the first hand out in the Great Bloodletting that is getting a project from manuscript to print, I have never once had to nudge Mark, or began to wonder if he had forgotten. In fact, I have approached Purple Duck Games on more than one occasion, with a wild scheme that required him to making payments before a manuscript even existed. Not only did Mark Gedak give me help and advice, on all of those occasions he bought into the project, taking the upfront costs out of his own coffers. Of course, we already had a working relationship at that point, but even so Purple Duck Games has treated me more than fairly. If you're looking for a publisher open to new authors, and that has both the desire and tools to help you succeed, you could do far worse than Purple Duck Games. Which brings me to my second aim: To announce (and support) the Dungeon Crawl Classics Patreon set up by Purple Duck Games. 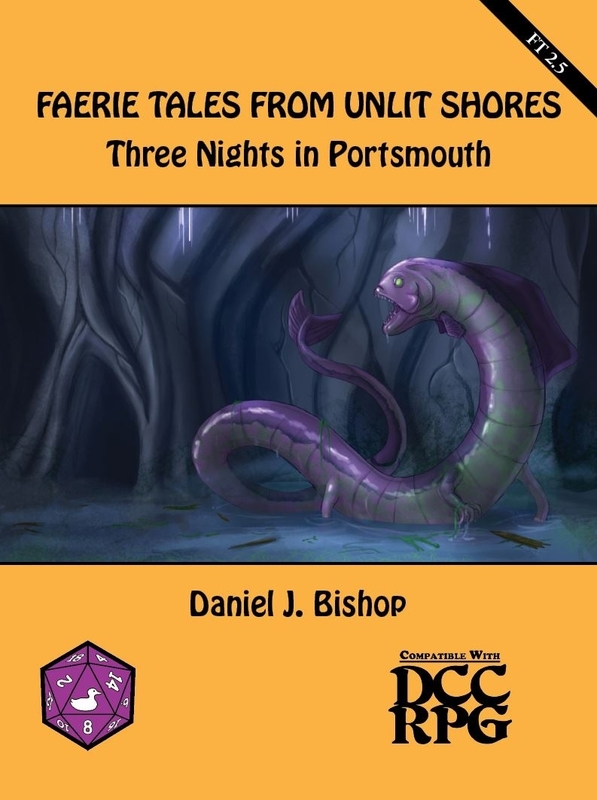 This Patreon is designed to help fund the development of further Dungeon Crawl Classics Role-Playing Game from Purple Duck Games. It will allow Purple Duck to continue to offer releases in the AL, CE, FT, Dispatches and PM lines and provide both their writers and artists with a greater return on their investment. Everything in that tentative initial release schedule is already written. It should be clear to you, Gentle Reader, that my name comes up a bit often on the DCC side of Purple Duck Games' catalog. There is plenty of room for other writers in that stable! Purple Duck Games can be reached at their Facebook page if you want to pitch an idea. I encourage you to do so. The AL Series needs more writers, and not everything Purple Duck Games does needs to be part of a series - witness the excellent Death Slaves of Eternity by Marzio Muscedere! In any event, please consider the Patreon, because there is a lot more coming from the Ducks!